Nothing says Spring has sprung more resoundingly than a good floral print. And I can't think of a more cheerfully classic and lovely floral print than one by Liberty London. I've been lucky to collect my share of Liberty scarves, a vintage skirt or two and top, and when Target did their Liberty collection, I confess I bought more than my share. 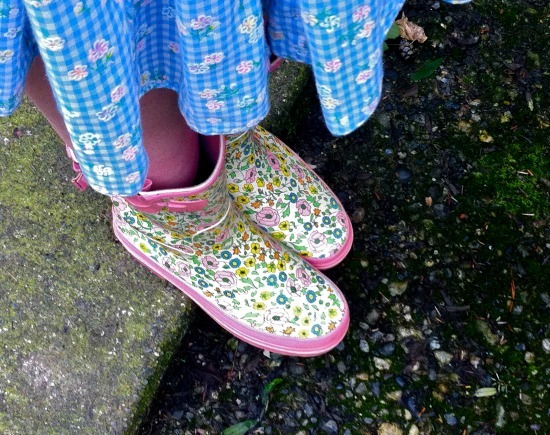 So when I saw these great pink and floral rain boots in a thrift store for $5, I had to throw down. They are children's boots, but my feet are small, and they fit like a charm! So glad I "shopped outside the box" and explored the kid's shoe section. So even on a rainy and grey day, I feel cheered in my #SECONDHANDFIRST™ Liberty boots, and find the strength to take the world by storm. Love your "wellies" im stomping around in my old rubber boots with unioun jack on the whole day but sorry to say that tbere is not enough time to take pics and be a part of shoe shine today! Those boots are so cute! I didn't know Target did a Liberty range - and I missed it. I love their prints. I have never owned a pair of rubber boots! Linking up today with my woo! orange shoes! Thanks, Bella! Love those boots! Every time I go to ACL music festival it rains and I curse myself for not owning a pair of these! I love, let's make that LOVE, your rain boots! What a great find. I too, have scored a few fun pairs of wellies in the children's section. Your dress is also adorable! I love the wellies! Last year I picked up a chocolate brown pair with little pink horses all over them. They were perfect for the Kentucky Derby where it rained all day. Practical can always be stylish! The footprints made by these boots probably fill up with flowers with every step you take. I love how they scream SPRING! I am soooooooo glad to join you twice today. Oh to have feet that fit kids shoes! I barely fit into adult's! Your boots are magic, but I hope you don't have too much rain...just enough to water those gorgeous flowers. Those are tiny feet. You must have your pick of second hand beauties. Thanks for the shoeshine, Bella. Your floral boots are so fun and vibrant! thanks for the sweet comments on my blog Bella. I see many of my blogging friends here, I must join in more often! Those boots are like walking in Spring. So stupid of me. Lack of time has led me astray from your blog. Therefore I missed this Shoe Shine again. I am sad. SECONDHAND FIRST™: April Link Up!